Over/Under: Over 159.0 at 1.90 Bet Now! A win in their last outing gave the Istanbul side their first win of the campaign. They may be currently sitting with a 1-3 record but they’ll be looking to take that win and propel themselves into a bit of form. The Greeks head to Turkey with a 3-1 record and they’ll be keen to make their form and strength count in this game. While it is the Greeks that hold the upper hand in the head to head between these two teams, it is the Istanbul side that won the most recent encounter between these teams. This came in the Top 16 of last season and Anadolu won 91-86 at home. A repeat showing this Friday night will be of particular interest to the hosts. Key players for the Istanbul side this season include DeShaun Thomas, who has notched an average of 13 points per game this season and Derrick Brown who has managed to provide an average of 12.5 points per game. Another key player has been Tyler Honeycutt who have delivered some big performances. Another good showing on Friday could lead to a home win. The Greeks come into this game after having won their two most recent games and they know they hold the historical advantage over Anadolu. Panathinaikos have won 4 of the last 5 games between these two teams and the overall record is 11-6 in favour of the Greens. That counts for nothing though and it is up to players like Nick Calathes, with an average of 13 points per game and KC Rivers, with an average of 12 points per game, that have made the difference when it comes to winning games. The Greek side have also played well defensively, limiting opponents to an average of 74.8 points a game. 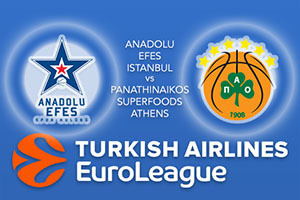 The Turkish side will want another win to get their season up and running but look to take Panathinaikos Superfoods Athens at +3, which is provided at odds of 1.90. if you want to use the Over/Under market, look to go OVER 159.0 and this is on offer at odds of 1.90.